Age as on 01-01-2018(Min.-Max.) : 18 yrs. – 44 yrs. Applicants must possess the qualifications from a recognized Institution / Board as detailed below or equivalent thereto, as specified in the relevant Rules of TSNPDCLas onthe date of Notification. Educational qualification : Must have a Diploma in Electrical Engineering (DEE) (or) Diploma in Electrical & Electronics Engineering(DEEE) or Graduation in Electrical Engineering in addition to Diploma in Electrical Engineering (or) Electrical & Electronics Engineering or any other equivalent qualification recognized by the Board/University of United Govt. of A.P./T.S/India/ UGC/DEC/AICTE as the case may be. Step:- Payment of Fee: The Applicant should pay the prescribed Fee as per the notificationas detailed above and obtain Fee paid receipt with Journal Number (12 digit) in the first instance. Step:- Submission of Application: After payment of Fee, the Candidate has to visit thewebsite http://tsnpdcl.cgg.gov.in to view the detailed notification, User Guide and Application Form. The applicants have to provide payment details (journal number and date) and upload the scanned copy of passport size photograph with signature (see instructions for scanning and uploading photograph with signature) and then invariably fill all the relevant fields in the Application. Immediately on submission of application, applicant will get an acknowledgement in the form of a downloadable pdf document. The written test comprising of 100 marks consisting of 100 multiple choice questions and each question carries 1 mark. The section A consisting of 80 questions on core technical subject and the section B consisting of 20 questions on General Awareness and Numerical Ability. Syllabus: The syllabus for the written examination is placed at Annexure II. Hall Tickets: The hall tickets will be placed on the website seven days prior to the date ofexamination. The candidate has to down load the Hall ticket from the website only. Hall tickets will not be sent to the candidates by post. 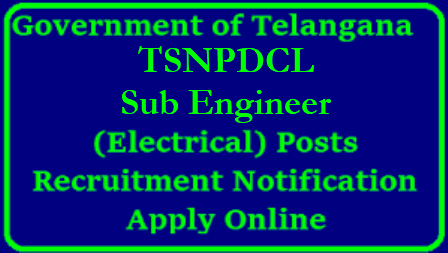 Date of examination: The written examination for recruitment of Sub-Engineer/Elecl. will beheld on 08-7-2018 from 10.30 AM to 12.30 PM. Examination Centers: The written examination for recruitment Sub-Engineer/Elecl. will beheld at different centers located in the GHMC area, Hyderabad & GWMC area of Warangal.